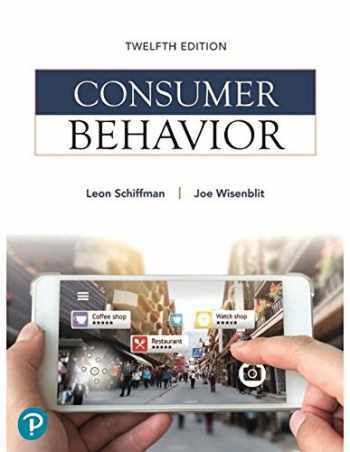 Acknowledged author Leon G. Schiffman wrote Consumer Behavior comprising 512 pages back in 2018. Textbook and etextbook are published under ISBN 0134734823 and 9780134734828. Since then Consumer Behavior textbook received total rating of 4 stars and was available to sell back to BooksRun online for the top buyback price of $107.64 or rent at the marketplace. For undergraduate and graduate courses in consumer behavior. Strategic applications for understanding consumer behavior Consumer Behavior, 12th Edition explores how the examination and application of consumer behavior is central to the planning, development, and implementation of successful marketing strategies. With an emphasis on developing a variety of useful skills, this text prepares readers for careers in brand management, advertising, and consumer research. The 12th Edition has been significantly updated to address contemporary trends and issues, including the role of new media, technological advances, and recent ethical concerns affecting the industry.